Q. What’s the difference between a journal and a database? A journal is a publication comprised of articles that focuses on one specific topic or area. Some journals may only be published once a year while other may be published more frequently. Often a journal’s title will indicate their topic. A database is an online tool comprised of many journals that often focuses on a broad area. Databases are constantly updated. A database’s name doesn’t always indicate their scope. Generally, databases will get you more initial results since they search a greater area, but some of those results might not be as relevant to your topic. Searching within one journal will get you fewer results, but they might be more relevant. For example, if a student is writing a paper on Cormac McCarthy, they might want to start by searching The Cormac McCarthy Journal and then move on to a database that covers literature like JSTOR. You’ll also need to know the difference when constructing a citation since most citations require the journal title and the database name. 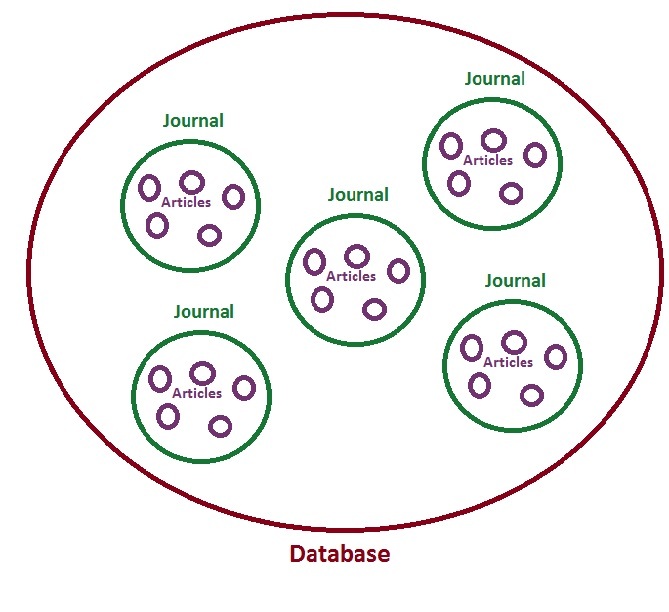 Here’s a graphic that shows the relationship between articles, journals, and databases.